The pic is my baby Amethyst we just got her and she had never seen snow before. I don't know why, I just collect Bella Sara cards and I just love the names that are on there. It seems like they are magical creature names!And they are so elegant. And they are also very different than any other names I have ever heard! My name is Leah and your horse is BEAUTIFUL!!!!! he really never saw snow before???!!! HA!!!HA!!!HA!!! Just wanted to say that you have a very nice horse with you! 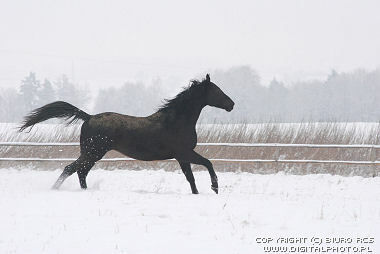 My horse (Spotted Saddle) Horse is going to have a foal on March 14th 2011!!! I am Hoping and Praying for a Buckskin Filly!! Bye!!! Just wanted to say that my name is Rhiannon. I found it quite ironic to see that as a horse name because Rhiannon is such a rare name.